Inappropriate elimination (Urination and/or Defecation) is when a previously litter box trained cat begins urinating or defecating in areas other than their litter box. This problem can be caused both medical and behavioral causes. A blockage of the urinary tract can constitute a medical emergency, especially with a male cat, and can result in death. If your cat is experiencing urinary issues, contact your veterinarian immediately. 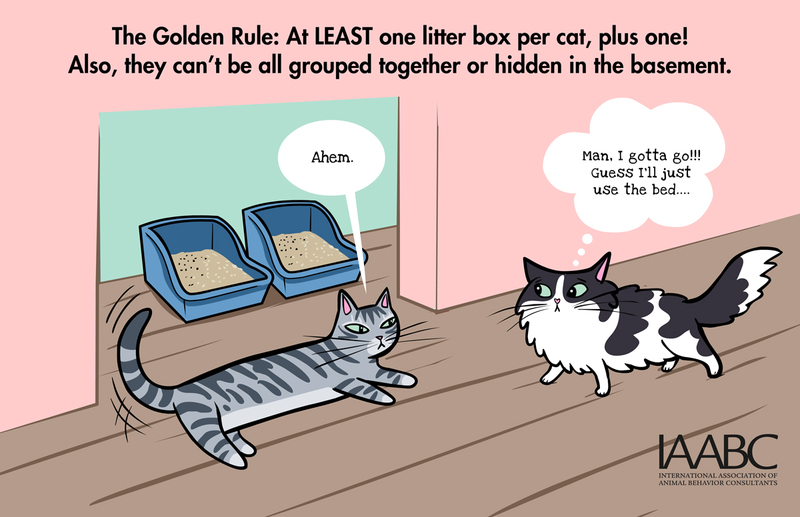 If you have multiple cats, resolving an inappropriate elimination problem can be especially difficult because you must first determine which of the cats is eliminating inappropriately. Talk to your veterinarian and they can provide you with a non-toxic, fluorescent dye that you can feed one of the cats. The urine of the cat fed the dye will fluoresce when exposed to a black light, thus allowing you to determine where that cat is urinating. When you know which cat is the problem, have them examined by your veterinarian so they can rule out any medical reasons for the cats change in elimination habits. Medical conditions that can cause inappropriate elimination include diabetes mellitus, hyperthyroidism, kidney or liver disease, colitis, inflammatory bowel disease, and feline lower urinary tract disease (FLUTD). Anything that causes pain when urinating or defecating may also be a contributing factor. If your cat has arthritis and you have a box with high sides, your cat may find it painful to get in and out of the litter box and thus may choose to eliminate elsewhere. As a cat gets older, they may experience some cognitive dysfunction that can also cause changes in elimination habits. Behavioral causes of inappropriate elimination are usually stress related. Any change can be a stressor. Evaluate any changes you have made in the desired elimination area. The Number of litter boxes – Suddenly having fewer litter boxes can be a stressor. We recommend one for each cat, in separate locations, plus one extra. For two cats we would recommend three litter boxes in three different areas throughout your home. Three litter boxes lined up side by side, especially if one cat starts guarding the litter boxes from the other cat, may not work and adding a litter box in a separate location may be all you need to do to solve your problem. Location of the litter box – If the problem started after you moved the litter box, try putting the litter box back in its old location with a new one in the new location. If the cat resumes using the box in the old location, place some of the soiled litter from the old box in the new box, and your cat may figure out what you want. 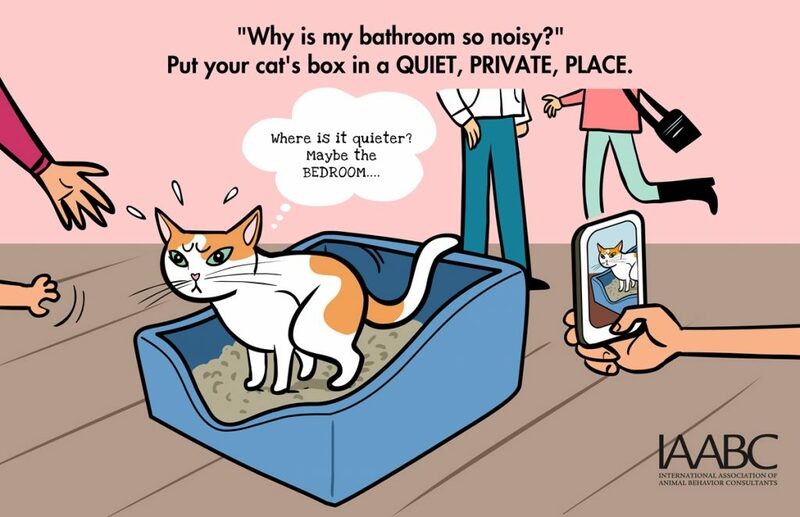 Equipment and objects next to the litter box – Most of us like to put the litter box in a secluded location out of major household traffic patterns. This is a good choice for the cat as well unless the box is next to some piece of equipment that has the potential to make noise or move when they are using the litter box. A clothes dryer may normally be okay but when unbalanced it can make louder and different noises. A malfunctioning furnace in need of a cleaning can also be startling when it kicks in. If the cat is scared once, they may abandon the use of the litter box in this location. The size of litter box – The size of the litter box, especially the height of the sides, can be a big deal to a cat especially if it is suddenly more difficult to get in or out. If you have a large cat, you need a large litter box that will contain your cat comfortably. Often litter boxes are too small. The type of litter box – Some cats prefer the traditional open litter box while some prefer the privacy offer by a covered litter box. While the automatic cleaning litter boxes are a great convenience for us, the noises and motions they make when operating can be scary to some cats and can cause them to stop using the box. The depth of litter in the litter box – Sometimes we humans like to load up the box with litter thinking we’ll need to change it less often. Many cats will stop using the box if there is too much litter or too little litter. 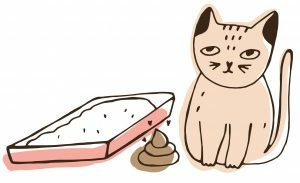 How often you clean the litter box – Many cats will not use a dirty litter box, and their definition of dirty may be different from ours. We recommend scooping at least once a day and changing all litter and washing the box weekly. Very few cats object to a litter box that is too clean. Chemicals used to clean the litter box – Cats are very sensitive to odors, so when washing your litter box do not use a strong smelling cleaner and make sure that you rinse it thoroughly. The litter used (Brand, Material, and Scent) – Cat litter comes in a wide variety of substrates (non-clumping, clumping, sand, wood chips, corn cobs, newspaper, scented, unscented, etc.). Not all cats are going to like all types of litter no matter how much we like them. If you had something that worked before, switch back. Many cats are especially sensitive to some of the scented litters. Other changes in the cat’s environment, not related to the litter box, may cause elimination and defecation issues. Changes you should review are listed below. Changes in diet – Most cats need and demand changes in their diets; however, a change in diet can also cause changes in elimination habits especially if the new food is causing some digestive upset. If you have recently changed foods, try changing back and see if that helps. Changes in medications – If your cat has recently been put on medications or has had a change in the dosage of an existing medication, ask your veterinarian if this could have any effect on elimination habits. Household changes – The domestic cat is a social species and usually bonds closely with those in its immediate household. The loss of a family member or another pet can trigger depression and grief that can sometimes be enough of a stressor to cause a change in eating, elimination and sleeping habits. Likewise the addition of a new family member, human or animal can also be a stressor. If the elimination problem has started after the addition of a new cat or dog, you will want to work with an animal behavior consultant to assist you in assessing and changing the relationship between the two pets. It is not unheard of for one cat to guard access to the litter box by the other cat. This does not necessarily mean they will fight. It might be as simple as one cat lying at the top of the basement stairs which will prevent the other cat from going downstairs. A pet behavior consultant can often help restore harmony to your pet family; however, be advised that this does not always work out. Occasionally one needs to make a choice of living with a problem or re-homing one of the pets. Cats are also very sensitive to everything in their environment and sometimes moving furniture around, changing access to certain rooms or adding or removing furnishings can be a stressor. Changes outside of the home – If our cat is an “indoor only” cat we tend to believe that they are only concerned about their immediate environment – what’s inside the house. That is not the case. Cats can be very territorial and a new cat or dog in the neighborhood, especially one frequently hanging around your home, can be a stressor. 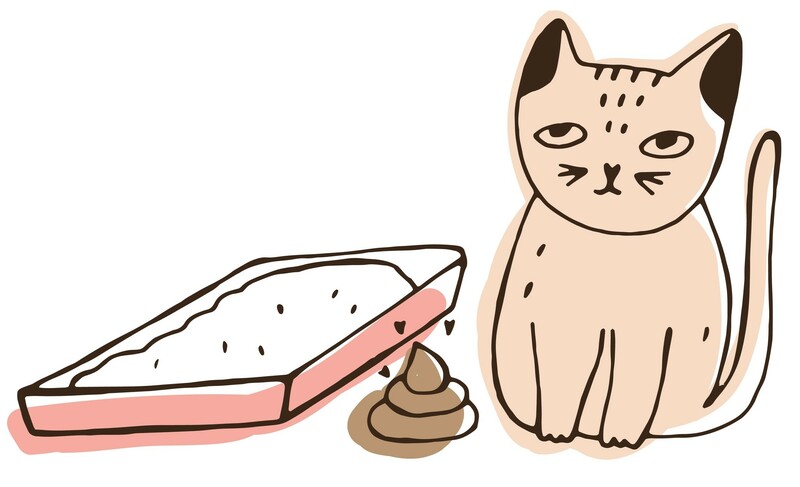 Cats mark their territory with both urine and feces. Territorial concerns may cause inappropriate elimination. When marking territory with feces, it is usually left uncovered, so it is obvious to other cats in the area. Urinating as a territorial response occurs in two forms; 1) spraying and 2) marking. Spraying typically involves backing up to a vertical surface and spraying urine. Spraying is a very overt act by a confident cat that wants to be seen. Marking involves small drops of urine on a horizontal surface and is usually the result of a non-confident cat that does not want to be observed. Vertical scratching is also a very overt behavior used to mark territory and when combined with spraying and feces marking suggests a territorial component to the cats’ inappropriate elimination. Other changes in your neighborhood may also be stressors for a cat. New neighbors, noisy, rambunctious children, a raccoon family visiting the yard, or a construction project can all be possible triggers for inappropriate elimination. Use an enzymatic cleaner like Nature’s Miracle or Urine Off! to thoroughly clean and deodorize any places your cat has eliminated inappropriately. You may need to use a black (ultra violet) light to find all of these spots. Avoid any use of punishment. Shouting at your cat, squirting them with a spray bottle, or throwing things at them, is very likely to make your cat feel more stressed and is very unlikely to resolve the problem. Review the list of changes that may have triggered your cats change in elimination habits. If you can undo any of those changes, do so. Locate your cat’s food and water bowls to the area where they are eliminating inappropriately and keep them in this location. Typically a cat will not eliminate near their food and water; however, this may just cause your cat to eliminate elsewhere. If possible, locate a litter box in the area where they are eliminating. If they use the box, try moving it gradually, a few inches every few days and see if you can retrain them. Start using Feliway® with your cat. Feliway® is a synthetic copy of the feline facial pheromone, used by cats to mark their territory as safe and secure. A pheromone is a chemical signal, conveyed by smell, which triggers a natural response in another member of the same species. A cat’s facial pheromone signals safety and security, so when detected by your cat it will help comfort and reassure them, reducing their stress. Feliway is available in a spray and an electric diffuser. Consult with a Bach Flower Remedy Registered Practitioner animal specialist and ask them to prepare an appropriate formulation of Bach Flower Remedies for your cat’s emotional state. Drug therapy, prescribed by a veterinarian with experience with behavioral medications, can help with many behavioral issues. Discuss your pet’s behavioral issues with your pet’s veterinarian and ask about medications that may be helpful. If your veterinarian is not comfortable and experienced using these drugs, you can work together with them and a veterinary behaviorist. Your veterinarian should be able to help you set up a relationship with a veterinary behaviorist. Here in Maine, the nearest veterinary behaviorists will be found at the Tufts Animal Behavior Clinic and the behavior clinic at MSPCA Angell, both of which are located in Massachusetts. 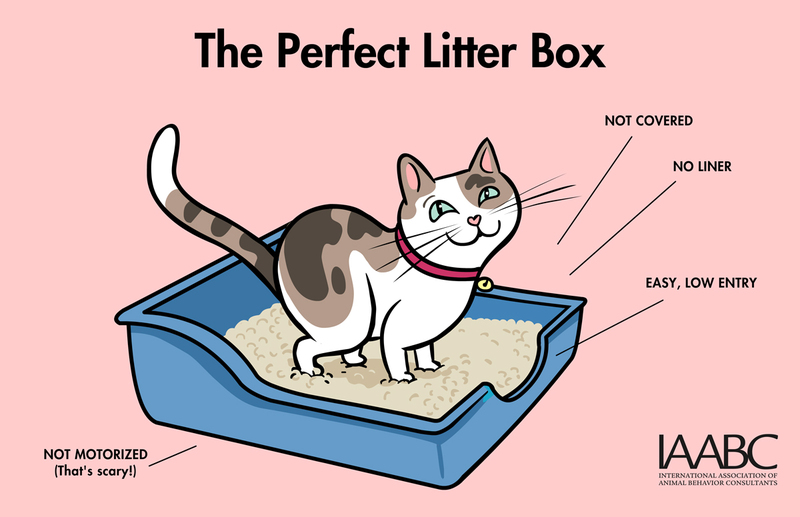 The following illustrations from the International Association of Animal Behavior Consultants (IAABC) provide excellent advice on your cats litterbox requirements.